If the criterion for success was admiration for an innovative concept, the One Laptop Per Child (OLPC) project would be an unqualified triumph. The project, which sought to put laptop computers into the hands of tens of millions of children in the developing world, attracted early funding from Google, AMD, and News Corporation and won numerous design awards. However, if the criterion was achieving its sales goals, the project would have to be judged a failure, despite some recent glimmers of progress. 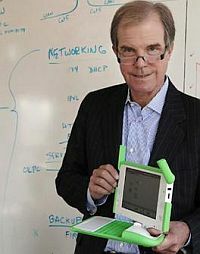 In 2005, Nicolas Negroponte, the MIT professor who initiated OLPC, predicted that 150 million of its pioneering XO-1 machines would be shipped annually by 2007.1 But midway through 2010, only about 1.6 million of them had been deployed to their intended recipients in less developed countries (LDCs). The discrepancy between the goals of OLPC management and their actual accomplishments provides an opportunity to analyze the particular challenges of propagating information and communication technologies for development (ICT4D). Although the OLPC initiative offered an innovative product, an unusually well-publicized launch, a technologically sophisticated design team, and a product assumed to be widely needed, it nonetheless failed to achieve its ambitious goals when it met its intended market. Our main argument is that OLPC's disappointing outcomes have occurred because its marketing in the broadest sense, including the product itself, did not effectively match the purchasing priorities of its intended customers: governments in developing nations. Our analysis of this failure, which OLPC may yet reverse, is intended to help managers leverage other innovations in emerging markets with greater success. The analysis draws principally from secondary sources, primarily interviews with and writings by experts in education and development, representatives of governments that have been asked to purchase OLPC, and individuals formerly affiliated with the project. We also examined OLPC Foundation financial statements. We first describe the laptop product itself, its intended markets, and the incompatibility of first-stage OLPC marketing efforts with a model of purchasing criteria employed by the potential customers, LDC governments. We then discuss what OLPC management experienced and others can learn concerning the marketing of innovations internationally, particularly in developing nations. We conclude by offering strategic alternatives that might have provided, or still might provide, better results for OLPC and for other innovators. These alternatives include working with an innovator's value net of customers, suppliers, complementary organizations, and even competitors. Download & continue reading Cautions from one laptop per child in marketing technological innovation to LDCs, by Emmanuel Yujuico and Betsy D. Gelb. In fact, the article seems specifically written for OLPC as a disection of its abject failure. The sad part is that, even to this day, the project supporters fail to provide much-needed objective criticism. I don't think that OLPC has failed, this is a logshot process, meanwhile i also think that OLPC is not the only one to blame in all the errors, countries and partners have much to do also. Look for differences between Peru, Uruguay and Nepal for example. “we don’t see things as they are. We see things as we are”.